A University of Southampton scientist whose groundbreaking research has benefited millions of people worldwide has been honoured by The Royal Society. Timothy Leighton, Professor of Ultrasonics and Underwater Acoustics, was today (Tuesday 18 July) announced as recipient of the Clifford Paterson Medal “for translation of his fundamental research into acoustics and its application in many areas including anti-microbial resistance, mine detection, foetal scanning, catastrophe relief, climate change and marine life”. The medal is presented every other year to an outstanding researcher in the field of engineering. Professor Leighton has worked at the University of Southampton since 1992, when he joined the Institute of Sound and Vibration Research (ISVR), part of Engineering and the Environment, as a lecturer in underwater acoustics. Inspired by a curiosity about the babbling sound made by streams, he has translated his theoretical research about bubble acoustics and ultrasonics into multiple real-world applications, including devices for healthcare, catastrophe relief and industry. 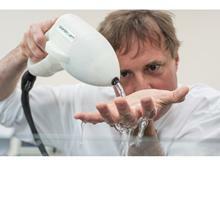 His inventions include the world’s only sonar capable of detecting mines in bubbly seawater – which he based on his theory of dolphin maths – and a cleaning system based on ultrasonically stimulating then controlling the motion of bubble walls to turn them into microscopic ‘scrubbing machines’, dramatically improving the cleaning power of cold water. He also helped develop the safety guidelines under which, to date, two billion babies in the womb have been ultrasonically imaged, while his conical bubble theories led to the invention and supply of more than a million migraine treatments. Other inventions were designed to help with osteoporosis, kidney disease and finding buried survivors in collapsed buildings. He has also explained aspects of whale behaviour, devised sensors to measure parameters key to Earth’s carbon budget, and even enabled planetaria around the world to play for their audiences the sounds that other planets will make – decades before those sounds are likely to be recorded. As well as running his own research laboratory, he is founder and chairman of Network for Anti-Microbial Resistance and Infection Prevention (NAMRIP), which expanded to cover four continents as Global-NAMRIP, and Health Effects of Ultrasound in Air (HEFUA). Professor Leighton, who was elected a Fellow of the Royal Society in 2014, said: “I am humbled and honoured that my work has received the recognition of the Royal Society through this award.